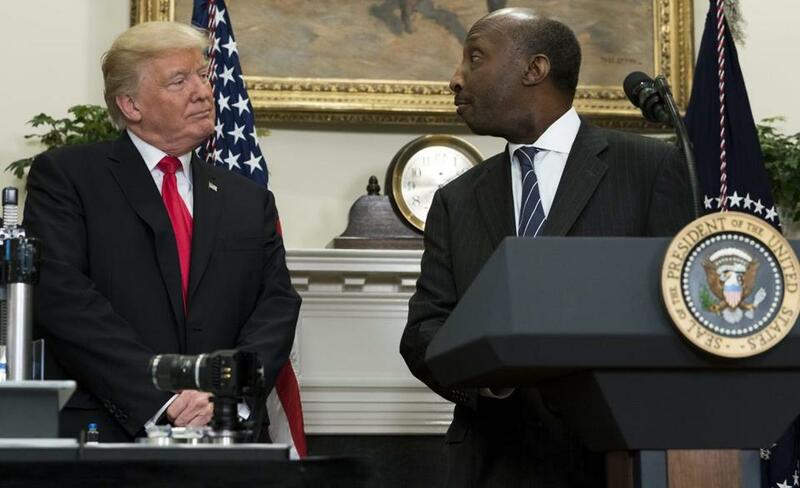 President Trump spoke with Merck chief executive Ken Frazier at the White House on July 20. Frazier said last week that he was quitting a council that advised the president. By finally pulling the foundation out from under two teetering CEO advisory councils, the Trump administration may have unwittingly weakened a fundamental pillar of economics that has dictated the role the corporate executive plays in society for the past 50 years. It’s long overdue. The CEOs of several of the world’s biggest companies have made public, political decisions to rebuke the administration. That may be good for their consciences. But it may not be good for their companies — unforgivable sins in some economic circles. This has been widely adopted as the guiding principal of the public company, with far-reaching consequences. It allows executives to claim, both ethically and legally, that any action is justified, so long as it enriches shareholders. By focusing on profits, companies can ignore or exploit other stakeholders when convenient. If an employer can find someone willing to do a job for the lowest allowable wage, he would be violating his pact with shareholders to pay more. If it is cheapest to dump poisonous chemicals into a river and there are no regulations forbidding it, the river is where those chemicals should go. The shareholder value revolution has left its share of scars: superfund sites, cancer clusters, and ravished populations battling over increasingly scarce resources. Much of man-made climate change can be attributed to the actions of large corporations whose investors can hide behind the executives who have been ordered to do what is necessary to make money. In other words, many of the harmful decisions made by corporate executives cannot be undone. Yet this bedrock philosophy of money before morals might have started cracking. The CEO of Walmart denounced President Donald Trump’s response to the racist violence in Charlottesville. Resignations by executives from Merck, Intel, Under Armour and others led to the disbanding of presidential advisory councils. Given the president’s penchant for sycophants and deregulation, these executives may have best served their investors by staying silent publicly while helping guide favorable policies behind the scenes. Instead, several of them have joined the ever-expanding Twitter roster that is Trump’s enemies list. Calling these resignations “heroic” would be melodramatic. But they are baby steps towards repairing the planet, stabilizing global politics, and moving toward a more equitable society. These executives took risks by standing up to societal wrongs. It is now the responsibility of their bosses to reward them. Those bosses, though, are the millions of people who own shares or have their retirement savings invested in diversified mutual funds. In other words, they are us. The only way to shift from a shareholder outcry to a stakeholder revolt is for shareholders to insist that CEOs re-think their job descriptions. Much like the fight to preserve Obamacare involved angry voters flooding elected officials’ phone lines, this movement will require that shareholders call investor relations departments and make their voices heard by punishing or rewarding executives based on their commitment to our shared values. Corporate America is a democracy. But unlike the government, where those who don’t vote can claim that they are not responsible for the outcome, shareholders who don’t vote are still owners and are still responsible for the damage their companies cause.